Two scenes from Lake Lucerne more than a century after being settled. Mr. Hughey built a log cabin in the area that is likely covered with I-4 and the 408 today. There he lived for 20 years. His home was open to many travelers. And his acreage was used to grow cotton fields and orange groves. 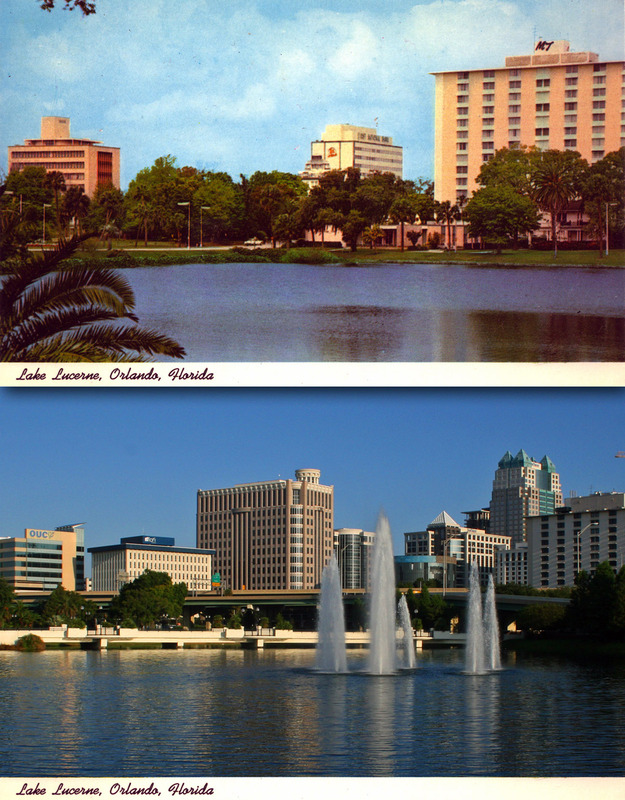 Lake Lucerne has continued to play a significant role in Orlando’s landscape for over 15o years. Later in the 1880’s it was the site of the Lucerne Hotel, and then the Dr. Phillips home. Today, the northern part lies under the 408 andOrange Avenue runs rights across it. It’s an understatement to say the view from the shores of Lake Lucerne are quite different from Mr. Hughey’s days. Before: This postcard was probably already old when it was mailed in 1985. It looks more like the sixties. While it’s difficult to read the date on the postmark, there is a 14 cent stamp on the back. That was the going rate for postcard stamps in ’85. The buildings pictured on the front are much older than the mid-eighties. The brick high-rise in the center: Orlando Federal Savings & Loan Association (1924); blue tiled building to the right: Orange County Courthouse Annex (earlier post) (1959); and far right: First Church of Christ Scientist (1928). 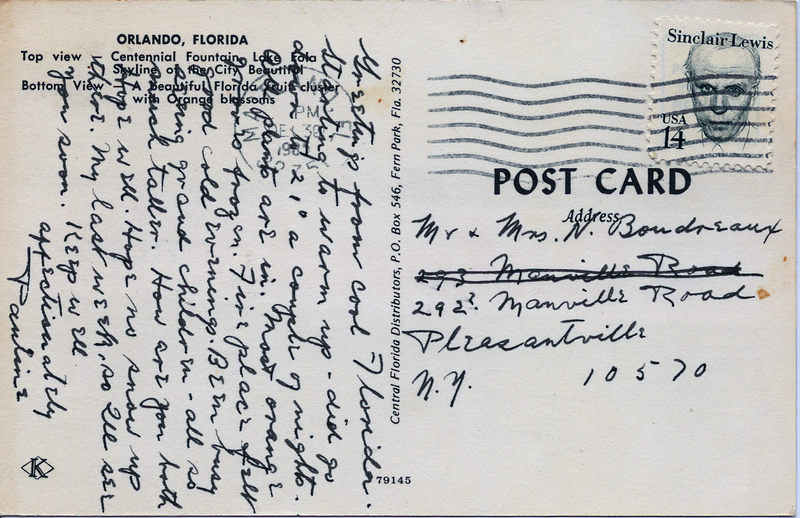 “Greetings from cool Florida.” The card was mailed on a rare Florida day with temperatures in the 20s. The postcard writer mentioned freezing orange groves and hoped there wasn’t any snow in New York state. 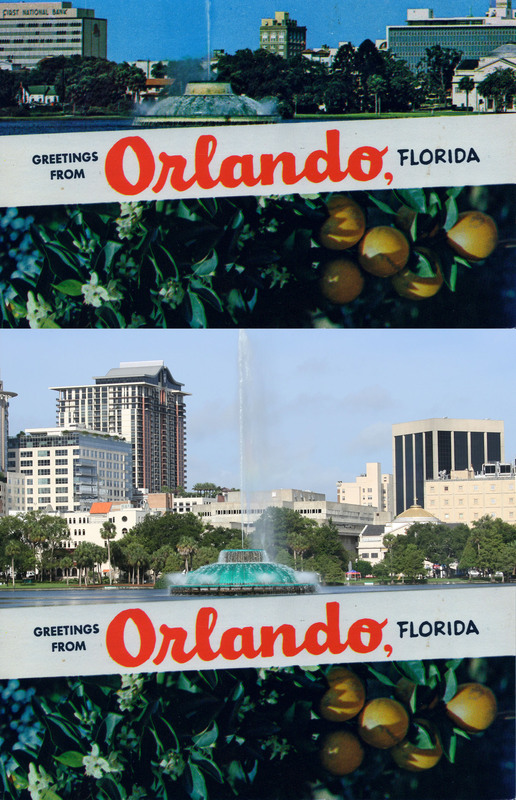 Today: Our Orlando skyline has grown up around Lake Eola. If the updated image were an actual postcard from that angle, it would need to be oversized to squeeze in the urban growth. Because orange groves are not as prevalent as they once were, a picture of a Clermont subdivision might be an appropriate “today” picture in place of the oranges.